May not be in the list of leisure travellers who seek idealism and romanticism, but the trek from Dalhousie to Manali over the Marhu Pass is in the trailing diary of each explorer. The broken track having steep climbs and descends, passing through thick forests and cutting across several gushing streams, just ensure the backpackers an unforgettable journey. Dalhousie at an elevation of 1,970 meters, with its colonial ambiance and sprawling green environment, is one of the popular hill stations that pull in traveller to frame some refreshing moments. 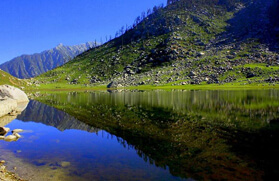 Further, Manali at an elevation of 2,050 meters is a hide-out for honeymoon couples during the peak season. Moreover, the mighty hill station turns out to be a popular adventure hub that attracts several adventurers from all over the world. The trek to Manali from Dalhousie en route to Marhu Pass further enriches the demented travellers with the traditional colours of Himachal Pradesh reflecting from the remote villages and whispering woods, which is a home to several animals, birds and plants. 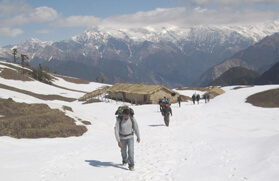 The trek to Manali from Dalhousie via Marhu Pass, which is at an elevation of 5,050 meters, commences from Khajjiar at 2,000 meters and turns to Chamba, which lies at a low altitude of 996 meters. From Chamba the journey wheels to Bharmour at 2,195 meters passing through villages like Rakh and Durghati. 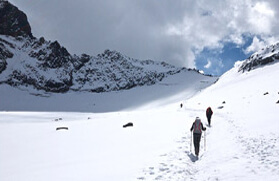 From Bharmour the trek to Hadsar at 2,317 meters is a moderate climb cutting across several small streams and passing through the thick forest. Thereafter from Hadsar the trail winds towards Kugti at 22,640 meters and thence snakes along the Budhil stream to Duggi Caves at 3,354 meters. 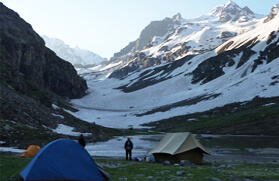 The trek to Alyas passes through a gentle meadow and heads to Khardu at 3,550 meters. 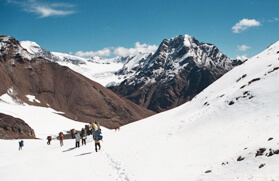 The trail turns strenuous when the steep climb commences towards Marhu Pass followed by a steep trek downhill to Shansha at 2,950 meters. From Shansha the journey wheels towards Keylong and leads to Manali. 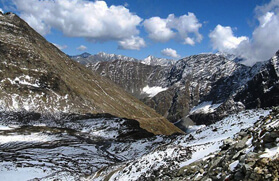 The Dalhousie to Manali Trek via Marhu Pass is one of the moderate treks in Himachal Pardesh and hence it requires acclimatization to the changing altitudes. 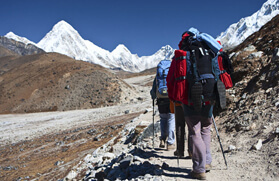 Amateur trekkers who decide to hit the tracks should carry necessary equipments and first aid. 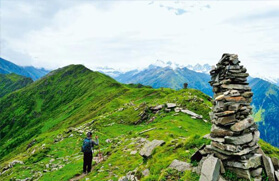 The best time to go for this trek is during the summer and autumn season. Day 01: Dalhousie to Khajjiar, 1,951m Distance 20-km. Either via Kalatop or direct through thick forests and the wild life sanctuary. Day 02: Khajjiar to Chamba, 9,96m, Distance 18-km. Descend and enjoy a good view of distant mountains and Ravi valley down below. 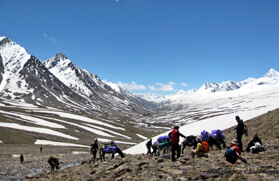 Day 03: Chamba to Bharmour, the Base Camps situated at 2,195m. Distance 64-km by bus via Rakh, Durghati and other villages. Visit old temples and other buildings of old capital of Chamba. Day 04: Bharmour to Hadsar, 2,317m, Distance 13-km. The route is along different terra up and down through forests. Day 05: Hadsar to Kugti, 2,640m, Distance 14-km. Day 06: Kugti to Duggi Caves, 3,354m, Distance 13-km. Amidst the green valley and panoramic view, Kartic temple at Keling is worth a visit. Kailash peak is also visible from here. Cave is sufficient for 15 persons. Day 07: Duggi to Alyas, 3,660m, Distance 12-km is a tough route. At Kudi there is a big grassy plateau and a stone hut. 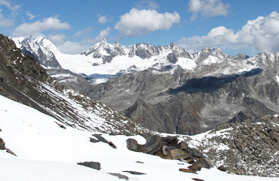 Day 08: Alyas to Khardu, 3,550m, Distance 15-km. Day 09: Khardu to Shansha, 2,950m, Distance 14-km. A rough trek over stones and loose boulders. 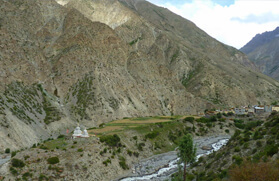 From here either go to Keylong or return to Udaipur via Triloknath. Day 10: Shansha to Keylong, 2,050m, Distance 7-hours journey by bus. Visit Kardang Monastery and meet the tribal people.